As you may already know Puglia for me represented an amazing surprise. Warm people, beautiful places and great food. Ostuni was the last stop for that beautiful day in May after visiting Alberobello and Locorotondo and after parking the car about 1 kilometer from the city center I started walking and admiring the white streets and houses Ostuni is famous for. In time as the hours flew by I felt hungry so I decided to try a recommendation from Trip Advisor namely Pescheria il Delfino. As I entered the restaurant and wanted to take a seat a young staff girl came to me and invited me to a separate room. As I entered this room I smiled because the restaurant is split in two: you can go in, chose what you want to eat from a large variety of fish and seafood or you can just go in, take it away fresh/raw and cook it yourself at home. Not related to my review I must say that I love places like this. Places where you can chose yourself what to eat and have it grilled/steamed/sautéed etc. the way you like it. The shop at Pescheria il Delfino is pretty big and you can chose many, many specialties and that is always great. You just chose, the food is weighted and then you tell them how you want it cooked and go to your table for the rest of the order. The place: the restaurant is split between an inside area, the shop and a covered terrace so you can say it is decent in size. Both the shop and the terrace on which I took my meal are clean so this is a big plus for me. Also the place is nothing luxurious, just a simple set up for locals and tourist to enjoy a meal. Staff: very nice and friendly. I did not interact with them a lot but I was satisfied with the service provided. Food: as you know from many of my reviews I am a big fan of fish and seafood and whenever I reach a place that serves fresh fish, fish caught there I will always try it. I chose something simple like barbuns(red mallet) with grilled squid and a few other items on the list. 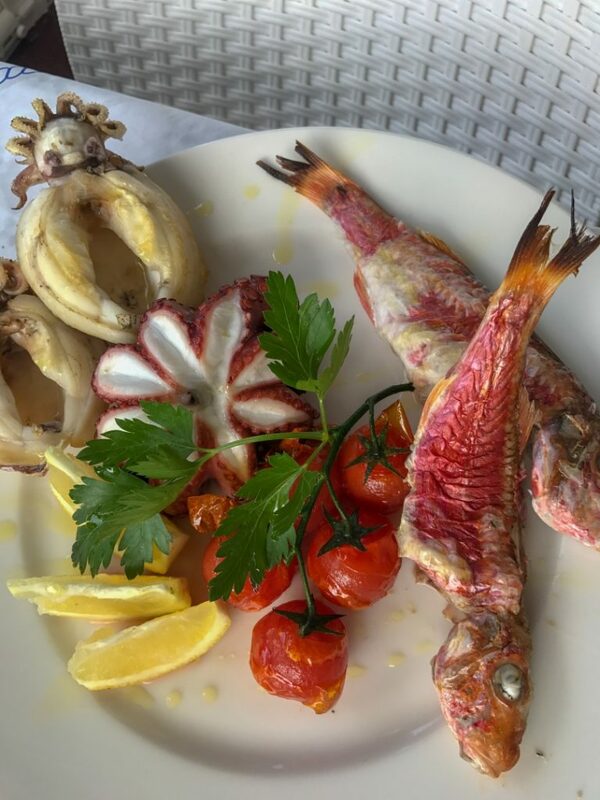 Before reviewing the food I must say that for me the reference in fish cooking are two places in Greece, O Giannis Fish Tavern and an amazing restaurant in Thessaloniki which I will review on a later article. For me the food in this place was decent. But that’s all. I would not place this restaurant in the top 5 places I ever ate and that’s because I felt the food a bit bland. I know it was only grilled but I ate grilled red mallet in two other places and it tasted amazing. The squid was decent but nothing to remember. I consider the meal taken here a decent meal but nothing special. None of the things I tried stuck to my mind and I think that says almost everything. While the food kept me full for a good time I did not feel satisfied with its taste and for me that is an important aspect when eating out at a local restaurant in a foreign place. Overall if I had to rate this place I would give it a 3 out of 5 stars. It is not bad but neither something to remember. If ever in Ostuni again, since I want to visit Puglia in the future one more time, I would try a different place to eat.